There were a variety of cultures in the Indian sub-continent during the second millennium B.C. This, points to a variety of people living in different parts of the county. It was during this period that a people speaking an Indo-Aryan language (which is the basis of Vedic Sanskrit) emerged in north-western India. Perhaps they came from north-eastern Iran or the region near the Caspian Sea or central Asia. They are called ‘Indo-Aryans’ to distinguish them from others who spoke various Aryan languages and went to western Asia and Europe. They are called ‘Aryans’ after their language. Archaeology found in the areas (Hastinapura and Ataranji-Khera in western U.P.) where the Aryan-speaking culture developed, there were settlements of people practising pastoralism and agriculture and using a distinctive painted grey pottery which goes by the technical name of ‘Painted Grey Ware’. In the regions adjoining these areas another pottery was used which, as its name suggests, was ‘Black-and-red Ware’, (the term ‘ware’ here refers to vessels made of baked clay). So it is now suggested that Vedic culture was a mixture of some new ideas and practices with some existing ones based on the local cultures. This period of Indian History is called the Vedic Age because its reconstruction is based on using the Vedic texts as sources. The word Veda means knowledge or the sacred spiritual knowledge. Scholars divide the Vedic period into two phases. The early Vedic phase is represented by the Rig Veda. The rivers like Ganga, Yamuna, Saraswati, Indus, sutlej are mentioned in RigVeda. Later Vedic phase is represented by all other Vedic literatures i.e. 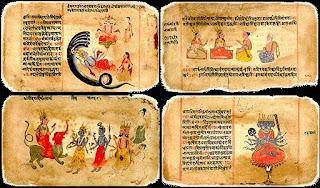 Sama Veda, Yajur Veda, Atharva Veda, Brahmanas, Aranyakas and Upanishads. During the Rig Vedic times, people were settled in the same area as represented by the Harappan civilization i.e. Afghanistan, Pakistan, Punjab, Gujarat, Rajasthan, Haryana, and western U.P. There used to be a river flowing nearby called Saraswati but the water of this river gradually dried up. The river Saraswati is considered as mother and most sacred river in RigVeda. They remained in these parts for many years, and composed the collection of hymns known as the Rig Veda. The Aryans came as pastoral nomads. Gradually they settled down permanently in villages and became full time farmers. Therefore their early habitation sites were villages. It is likely that in the process of settling down, they mixed with the existing people, some of whom were the descendants of the Harappans. During the later Vedic period people expanded to other areas of northern India mainly modern Uttar Pradesh, Bihar, West Bengal, and Madhya Pradesh. When they migrated eastwards into the Ganga valley, they cleared the thick forests as they went along. Some of these forests were burnt and some were cleared with iron axes for they had by now begun to make tools and weapons of iron. 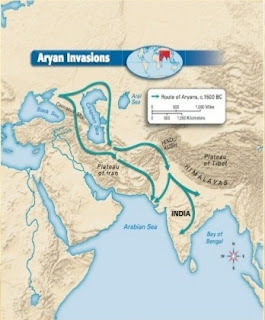 Aryans were hostile to the Indigenous people whom they referred to as DASAS and DASYUS. The dasas and dasyus did not worship the same gods as the Aryans. They spoke a language which was different from Vedic Sanskrit. Though some of the Dasa chiefs were treated with great respect, but many of the Dasa people were enslaved so that eventually the word ‘Dasa’ came to mean slave. So the word ‘Arya’ came to refer to any person who was respected. Society at that time was divided into tribes and each tribe settled in a particular region. But they often fought with each other. The herds of animals required grasslands for grazing and the tribes fought over the possession of these grasslands. Each tribe had its Raja, king or chief who was generally selected for his strength and bravery. Later kingship became hereditary. In the beginning, there appears to have been very small kingdoms ruled by kings called Rajan but in the later period there were large kingdoms known as Rashtra and some kings were known as Maharaja or Samrat. Name of such kingdoms, such as Bharatas, Tritrus, Yadus, Purus, Paktas etc. were mentioned in the RigVeda. The name of this country as Bharat is after the Rig Vedic people Bharata. 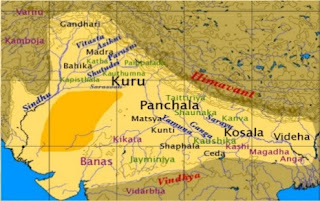 During the later period other kingdoms like Gandhara (modern Afghanistan), Kuru, Panchala, and Videha located in Uttar Pradesh and Bihar were established. SENANI – He used to be the commander of the warriors. PRIEST – He used to perform the religious ceremonies for the king and advised him. MESSENGER – He was the person through whom the king made contact with his tribesmen living in near villages. GRAMANI – He used to be the headman of the village. The tribe was split into small units called GRAMAS which comprised a number of families living in villages. A group of families was known as a CLAN or VIS. The people of the tribe were called JANA. The villages consisted of a group of thatched huts surrounded by a fence, with the fields lying outside the fence. Fields were ploughed and irrigated with water from wells or channels. Barley was widely grown, and later on, wheat and rice were also grown. Bulls and oxen were used for farming and drawing carts. The cow held pride of place among the animals. In fact, for special guests beef was served as a mark of honour. The cow was called Aghanya (is not to be killed or injured). Vedas prescribe punishment for injuring or killing cow by expulsion from the kingdom or by death penalty, as the case may be. A man’s life was valued as equal to that of a hundred cows. If a man killed another man, he had to give a hundred cows to the family of the dead man as a punishment. The horse is an animal which was not native to India and was brought in by the Aryans from Iran and Central Asia. The horse was used for drawing chariots which were used in battle. Chariot racing was a favourite amusement. The chariot maker was a respected member of society. A light two-wheeled chariot became a symbol of high status. In later periods kings are shown driving a chariot or sitting on an elephant. The horse also became an important religious symbol as is evident from the ASHVAMEDHA sacrifice when a horse was released and the territory over which it roamed was claimed by the king who had released it. 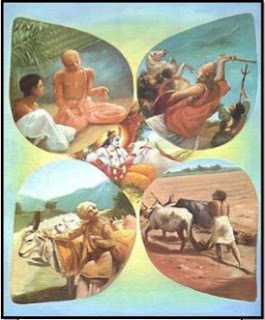 The Rig Vedic society mainly comprised of four Varnas, namely Brahman, Kshatriya, Vaisya, and shudra. This classification was based on worldly occupation of people and not on birth. The teachers were called Brahman; administrators and rulers were Kshatriya; farmers, merchants and bankers were Vaishya; and artisans and labourers were Shudra. But, in the later period the occupation became hereditary and people associated with the same occupations came to be known as Jati. With the proliferation of specialised skills Jati also proliferated. Also, the Varna and Jati system became rigid and moving from one to other became difficult. The Brahmans began by being equal in importance with the Kshatriyas, but slowly, they became so influential that they were given the first position. They did this by making religion very important and hence priests. As the priests were working as teachers also, young boys stayed with the priests to learn how to recite the hymns of Vedas. The priests were also the doctors in the village. They knew about herbs and plants and when someone fell ill, the priest was called to give medicine to the sick man. The family was patriarchal. People could marry the person of his or her own choice. Child marriage was unknown. The wife was the husband’s partner at all social and religious ceremonies. Women were respected and some enjoyed even the status of rishis. Some of the girls were educated along with the boys. The dress worn by these people was not very different from that of the people of Harappa. It consisted of two pieces of cloth-the upper cloth and the lower cloth. A garment which reached to the ankles and a turban to tie around the head were also in use. Ornaments were also used. These were made of gold or other metals, and the women wore beads in various fashions. The richer people were cloth which was embroidered with gold thread. Apart from chariot racing dancing and music were common. For music they used the flute, the lute which resembled the Veena, and the drum. But their favourite pastime appears to have been gambling. People ate dishes made of rice, wheat, flour, lentils, etc. Milk, butter, and ghee were very common. Fruits, vegetables, cereals and meat also formed the part of foods. They also drank Madhu and an intoxicating drink sura. Soma was drunk during special occasions, however, drinking of soma and sura were disapproved and discouraged. The economic life of Vedic people centered around agriculture, arts and crafts and trade and commerce. Hunting was another common occupation. Cattle rearing, fishing, Pottery making, weaving, tanning, metal-working and carpentry etc. were known among other occupations. Ayas i.e. copper was the only metal known to work with. In the later period a new metal was known to work i.e. iron. The use of iron goes back in India to a little before 1000 B.C. During the later period other occupations like maker of jewels, dyes, chariots bows and arrows and smelters. Copper (lohita ayas) and iron (syam ayas) came to be known by different names in later Vedic period. In the early period, people paid Bali (voluntary gift) to the king for his services to the people. Later this Bali became a regular tax known as SHULKA. NISKA was the name of the coin used. The earliest known work of the Aryans in India was the Rig Veda which is a collection of 1028 hymns in Vedic Sanskrit. Most of the hymns are in praise of different Vedic deities and were intended for recitation at the Yajnas or sacrifices. Many of them are beautiful descriptions of nature. The Rig Veda was followed by three more Vedas. 2. Yajur Veda – It gives directions for the performance of the Yajna. 3. Sama Veda – It prescribes the tunes for the recitation of the hymns of the Rig Veda. 4. Atharva Veda – It prescribes rites and rituals. After the four Vedas, a number of works called the Brahmans grew which contained detailed explanations of Vedic literature and instructions. The Aranyakas, which are an appendix to the Brahmanas, prescribed certain rites and also laid the basis of a body of more philosophical literature. It was the Upanishadic literature which dealt with questions like the origin of the Universe, birth and death, the material and spiritual world, nature of knowledge and many other questions. The earliest Upanishads are the Brihad-Aranyaka and Chandogya. The Upanishads are in the form of dialogues and expressed the highest thoughts in simple and beautiful imagery. Another body of literature to grow in the early period was the Vedangas. They were concerned with astronomy, grammar, and phonetics. One of the most outstanding works of this period was a classic on Sanskrit grammar, the Astadhyayi by Panini. All these works were in Sanskrit. They were handed down from generation to generation orally and were put to writing much later. Rig Vedic people worshipped forces of nature such as fire, sun, stars, moon, earth, wind, sky, trees, rivers and mountains all became gods and goddesses. Dyauspitar was the skygod; Indra was the god of rain, storm and war; Surya was the Sun-god; Agni was the god of fire, and Usha was the goddess of dawn. 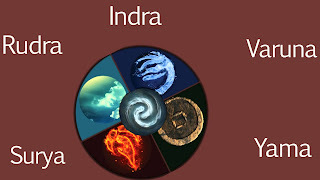 Indra, Agni, and Varuna were the most favourable gods. Indra was strong and he could strike down the demons and the enemies of the Aryans. The yajnas were the most common rituals. Mathematics has been called by the general name ganita which includes Arithmetic (anka ganita), Geometry (rekha ganita), Algebra (bija ganita), Astronomy and Astrology (jyotisha). Vedic people knew the methods of making squares equal in area to triangles or circles, calculate the sums and differences of squares. The zero was also known. The decimal system was also used. Cubes, cube roots, square roots and under roots were also known and used. Science was studied and various branches of science were well developed. Astronomy was so developed that they accurately prepared their calendars and predicting the time of solar and lunar eclipses. Great preparations were made for religious sacrifices. Altars were built and animals were sacrificed to the chanting of hymns by the priests. Gold, cattle, horses and cloth were given to the priests and soma was drunk. The priests prayed to the gods to hear the requests of the Raja and the people believed that the gods had heard them and would grant them their wishes. The priests became the messengers between the gods and men and so were naturally powerful. In the later Vedic period, the rituals and yajnas came to be regarded as very expensive and not the only way to achieve spiritual benefit and reach god. So, all the people were not satisfied with this religion of sacrifices. They had other questions to ask. They wanted to know how the world was created, who the gods were, who made man and so on. These philosophers wandered away from the villages into the quite places of the forest trying to find answers to their questions and to hold discussions among themselves. So, alternative means such as the path of knowledge were also developed. Their ideas were memorized and later recorded by their pupils. Roots of this path are visible in Rig Veda itself. These we can read today in the Upanishads (part of the Vedas) which were the works of most profound philosophy. Vedic age is the next major phase in ancient Indian history After Indus Civilization that began with the coming of the Indo-European speaking people in around 1500 B.C. and ended in about seventh century B.C. Initially, this phase marked a reversal in some respects. For example, it marked the end of city life, reversal to a pastoral economy and the predominance of a tribal system of political organisation. However with the knowledge and use of iron technology, it saw the beginning of the spread of agriculture throughout the country. Thus it laid the foundations of a civilization in all parts of the country, whereas the Harappan culture had been confined to parts of north-western India. The culture that began to emerge during this phase was the result of the intermixing of the Indo-Aryans with the pre-existing inhabitants of India.